Business at the Makerere University School of Social Sciences on Friday morning came to a standstill after a group of students attacked a lecturer and attempted to beat him up after he allegedly cancelled their examination results over suspected malpractice. Dr Anthony Juma Okuku locked himself in his office after about 400 students, armed with clubs and placards besieged him on learning that he had cancelled their results for the urban and rural development course unit over suspected malpractice. The students, all in their third and final year, kept at his office chanting, “We want our marks,” bringing business at the school to a standstill. 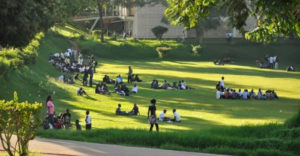 Hassan Wasswa, the class representative, told PML Daily that the problem has been persistent for all the years they have been at the university. Wasswa alleged that Dr Okuku has not been marking their scripts yet he gives them retakes. Abdul Kareem Ziritwawula, a 2017 contestant for the guild presidency, said they will not allow lectures to proceed at the school until they get their marks. “Enough is enough for this game of marks,” he said. The standoff attracted the attention of Dr Andrew State Erias, the school dean, who calmed down the students and said they will engage Dr Okuku and recover the scripts for re-marking. “We know your problem and we have already recovered all of your scripts. We are going to give them to a neutral lecturer for re-marking. Keep calm, we are in control,” Dr State said. “Even if there is copying, the whole class can’t copy; that cannot happen,” he added. He promised to engage the accused don and the Vice Chancellor to resolve the matter. The School of Social Sciences comprises of the departments of political science and public administration, Social work and social administration and sociology.